Sustainable Jazz has given birth to a recording, and it's a sweetheart. Each tune has its own special feel, from ballad to bounce, tango to swing. 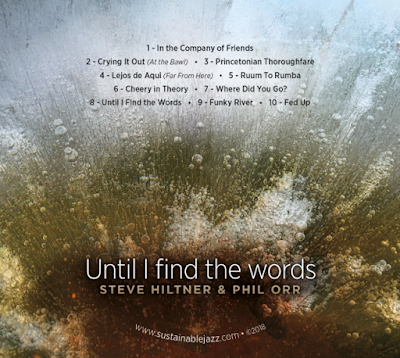 These are the tunes Phil and I have been performing at parties and concerts, recorded in a studio with a gorgeous piano sound. Cover photos are of my own taking, with bubbles trapped in ice on the cover, and the liquid mysteries of a vernal pool on the inside. What we feel for our audience. Memories of midwestern dance halls from a distant era. Long distance love--some know it well. Life is better if there's ruum to rumba. A musical account of a pretty flower that starts taking over the garden. Anyone who has lost someone dear without warning will know this feeling. A tango. "Until I find the words, I'll play this melody, this simple melody, to tell you of my love." This river gets funky in a good way. An unusual, driving groove that waited decades for its melody to come along. Check out online videos for samples of our music. Scroll down to these 1994 recordings by the Lunar Octet.